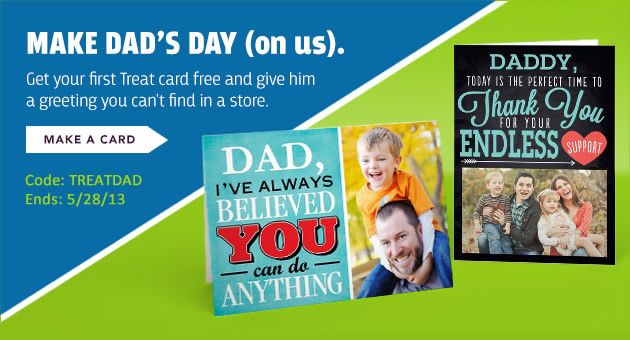 Treat is offering all new customers a FREE Father's Day card on May 27 and 28, 2013. This week save big on reception accessories and decorations. Get something special for everyone in your bridal party! From the ring-bearer to Mom, American Bridal has great gifts for everyone who is a part of your big day. Take this brilliant personalized MP3 Cooler Bag for example. Snacks and music go where you go with effortless ease, making this personalized mp3 cooler bag the perfect gift your bridesmaids and groomsmen, especially if you’re planning a beach or destination wedding. Pass these out at a pool party rehearsal dinner or picnic engagement party and watch their eyes light up! Find amazing accents and decorations that will complete your spring and summer wedding in our sale category. *Coupons, sale prices and free shipping valid through Sunday, June 2nd, 2013. A Minted Letterpress Wedding Invitation Suite. Two 18K white gold wedding rings from Brilliant Earth. Three bridesmaids dresses from Weddington Way. Three custom Indochino suit packages with accessories. Our 1st runner-up will win themselves $500 in Minted Wedding Stationery and our 2nd runner-up will win 3 Brilliant Earth Silver Pendants which will make great bridesmaids gifts. Your will have until Midnight PDT on May 27th 2013 to enter so don't delay!! American Bridal makes it easy to put your personal touch on every element of your wedding. This week save on a range of bestselling, personalized glassware at American Bridal. Check out these charming Mason glass drinking mugs. Crafted to resemble the classic American canning container, this design combines the past and present. Personalize the jar with your choice of over 40 designs. There are seasonal icons, whimsical motifs and many more. And with a full assortment of colors up for grabs, you're sure to find a tone to match your wedding theme. These personalized mason jar drinking glasses are perfect for your wedding party, reception attendants, ushers, ring bearers and plenty of other contributors. Do not forget to complete your wedding with beautiful favors and, memorable gifts and personalized accessories that celebrate your unique style from our sale category. *Coupons and sale prices valid through Sunday, May 26th 2013. From now through 5/21/2013 at 11:59pm PT, save 15% off wedding orders of $149 or more, 20% off orders of $249 or more or 25% off orders of $299 or more using the code WEDMAY25 at checkout. Offer expires 5/21/2013 at 11:59 pm (PT). Groomsmen have been there for you in good times and bad. Make sure to thank them with a special gift that commemorates your deep bond. For example, your groomsman will be well-prepared with this fashionable and functional cooler. The sturdy, stylish cooler can be personalized with your wedding groomsman's initials or even a monogram design at no additional charge. Save on watches, money clips, cuff links, outdoor gifts and more in the sale category. Affiliates Only! 15% off sitewide -- use code 15off. *Coupons and sale prices valid through Sunday, May 19th, 2013. Your best friends have been there for you through all the stresses of wedding planning. Thank them with a special gift from American Bridal. For example, these exquisite Pearl Pendant and Earrings are hand-polished to a fine finish and features hand-dipped glass pearls and hand-set cubic zirconium crystals. Beautiful and unique, this elegant pearl pendant set would make a fabulous bridesmaid gift. Make each detail of your wedding a treasured memory with unique favors, accessories, decorations and more in the sale category. 15% off sitewide -- use code 15off. *Coupons, sale prices and free shipping valid through Sunday, May 12th 2013. Save 10% off all graduation announcement and graduation invitation orders of $49 or more or 15% off orders of $99 or more using the code 15MAYGRAD at checkout. Offer expires 5/7/13 at 11:59 pm (PT). 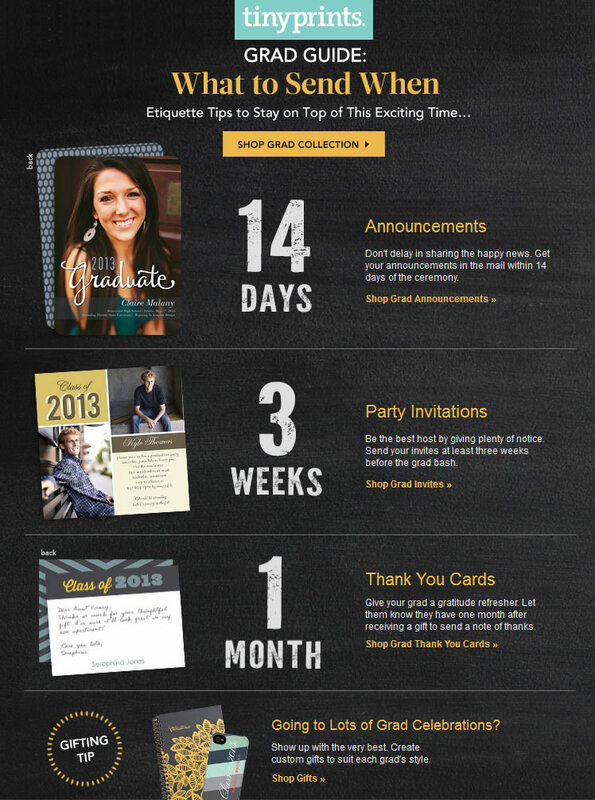 Confused about when to send those graduation invites? Below is a handy little timeline so you can be on top of things! 50% off all business cards, today only! If you are in the market for business cards, there has never been a better time to buy. 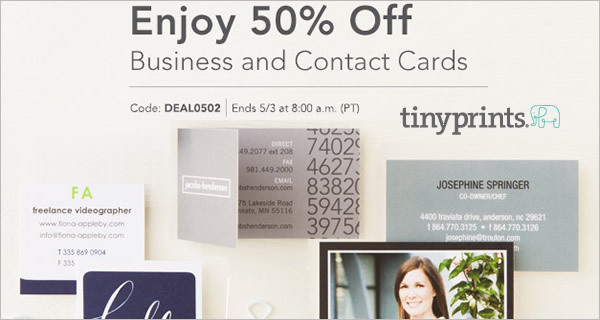 Tiny Prints, the leader in stylish and top-quality stationery, is offering 50% off business cards for less than 24 hours. 1. Visit their Deal of the Day Page. 2. Choose from hundreds of designs. 3. Edit the font, choose what information to include, and upload a logo and/or photo. This is your time to get creative. 4. Double-check your work. Make sure to proof the card. 5. When you checkout, use promo code DEAL0502 to save 50%. That's it. It really is that easy. P.S. You can also get 50% off mommy cards and grad contact cards on the same page.